Lenovo has more than just smartphones and tablets to reveal at CES 2015, with a couple of great new accessories worth a look too: the Vibe Selfie Flash that will work with any smartphone to provide better looking selfie illumination, and the Vibe Band, a stylish new fitness wearable with 24/7 battery life. The Vibe Selfie Flash is a weird looking critter. It’s a little accessory that plugs into the headphone port of your phone and packs a bunch of LEDs covered with opaque plastic to provide a soft but much more natural glow to your selfies. No other phone that I know of even has a front-facing flash, so this thing is a little ripper, especially when you consider shutter syncing and 100 shots per charge. A button on the back doubles as a shutter button once the Selfie Flash is turned on, and it can also be voice activated or swiveled to illuminate a macro subject. It’s all super simple plug’n’play action, and it’s actually pretty cool, especially if you’re prone to a little selfie action. Plus, it’s a steal: the Lenovo Vibe Selfie Flash price is just 29 USD. The Vibe Band VB10 is yet another fitness wearable but with a bit of a twist: instead of opting for the rather obvious brightly colored plastic, Lenovo has gone for a more stylish metallic look with a thin rubberized strap that looks removable (and is), but isn’t really meant to be. The Vibe Band features IPX7 water resistancy so it’ll handle sweat or a shower, and the always-on e-ink screen will get you through a week of usage on a single charge. The 1.4-inch curved readout will display up to 150 characters from emails, social media notifications or text messages and you’ll have all the benefits of outdoor readability you’d find with a Kindle. The Lenovo Vibe Band price is 89 USD and it weighs in at just 30 grams. The Vibe Band has a nice edge on looks, price and battery life and might make a nice gym accessory for the more fashion-minded fitness freaks out there. Like most fitness wearables though, its functionality is pretty limited, with just a few watch faces to choose from, a “find phone” function and the usual fitness bits like a pedometer and calorie counter but no screen rotation potential for easier reading on the narrow display. Look for the Vibe Selfie Flash release date to be April 2015 around the same time as the Vibe X2 Pro goes on sale. The Vibe Band release date will also be in April 2015, but again, not initially in the US. What do you think of these two new accessories? Think you might pick one up if you could? Well, it looks like the first day of CES2015 is all occupied by Lenovo Smartphinea and tablets.... I must say they do started concentrating towards their products! Nice one though.... I would like to get Vibe Selfie when its available in the stores !! 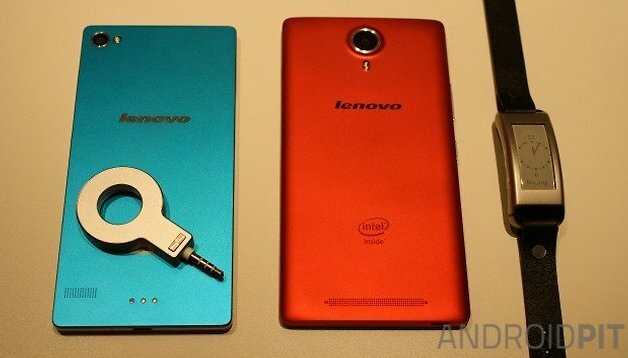 Lenovo is continuing to prove its worth and dominance in the smartphone market. Lost of users like the brand because they are able to get their money's worth.